Haiti is now in a recovery stage; the emergency relief aid has faded from the headlines as time has passed since the tragedy of 2010. 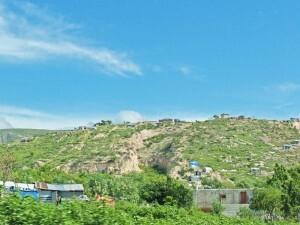 Part of my intention in The Quench Project has been to keep our focus on the tremendous need which continues in Haiti. Recovery may not be as compelling as relief, but it is every bit as important, if we ever want to see a strong, self-sufficient Haiti. Today [the Water Mission team] went out to a community development meeting about 40 kilometers from the WM base [in Port-au-Prince]. The purpose of the mission was to get community support for a new water system. Only about ten members of the community were present, so the water system, which has already received funding, through Mission of Hope Haiti, cannot move forward. They will setup a third meeting after distributing flyers to get more of the community involved. Experience has proven that without community support the system will break down and the resources will be wasted. 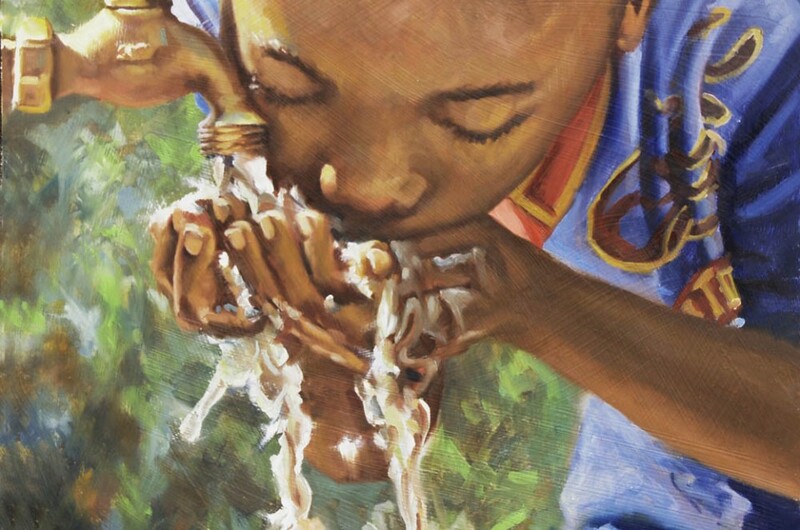 WM has installed about 300 water systems throughout Haiti. Most of the original systems are no longer working, which is heartbreaking. Julio tells me they have seen evidence of considerable looting and vandalism. WM teams have been chased away with machetes when trying to remove broken or obsolete equipment in order to repair or replace it with newer equipment. But those systems created in the last couple years, installed with community involvement, are still in place and have become an essential part of the community. George Greene, founder of WM, the engineer who is responsible for the solar powered, water filtration system WM is famous for, has also developed a one-piece cement latrine. These elegantly designed latrines continue to be installed in communities throughout Haiti. It is grueling, dangerous and expensive work. Julio explained to me how recovery is far more difficult a proposition than relief. Giving to those in desperate need – relief – is actually easier than building a community – recovery – where a reciprocal response and involvement is required and expected. Julio has set up a payment for water scenario to encourage a personal investment and community commitment. If someone is motivated to protect and maintain the system by profiting by its continued functioning, the system and the community will flourish. This is supply and demand in its purist form. Of course the cost for fifteen gallons of WM water is only three goodez rather than 36, which is the going rate for drinking water in most of Haiti. It is just enough money to pay a member of the community to maintain the system, creating jobs within the community and keeping the water flowing. WM currently has about 12 to 15 pending requests which have funding in place. But only those with a strong community development will receive the systems. The recovery process takes much more time and effort but it is far more beneficial in the long run for all concerned, than simply dropping supplies and perpetuating dependency. On the day I visited, the electricity from the government had just been turned back on in the area around Water Mission, after a three month interruption. It is now on for a few hours during the day and just after midnight. During other times most NGOs and individuals who can afford it, have diesel generators and batteries to maintain partial electricity. What that meant to me, was that on my last night in Haiti, I might actually be able to sleep in an air conditioned room. I am such a lightweight! 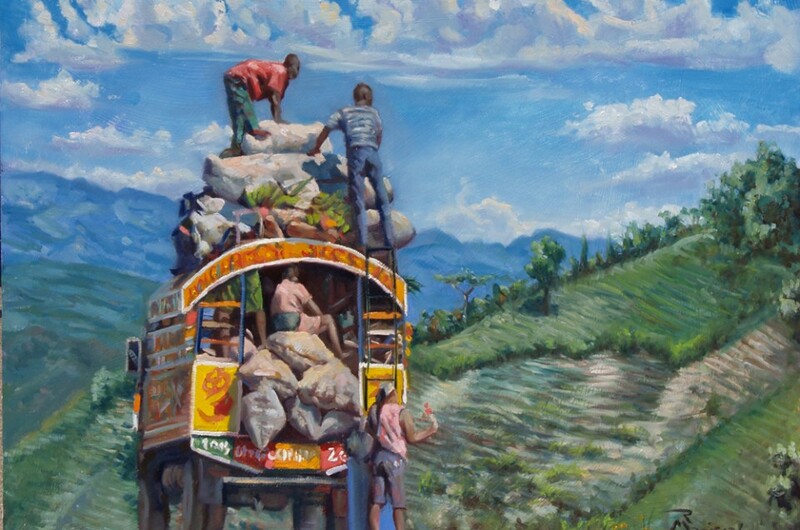 There is no trash collection, sanitation or running water in Haiti. There is sporadic electricity, if you’re lucky. In Jacmel, they were expecting a total blackout for the entire month of December. 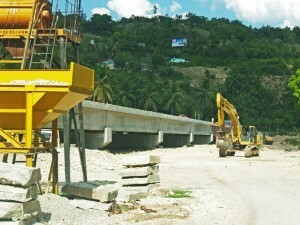 We made our way via a major roads project through the mountains, en route to and from Jacmel. We passed a huge cement bridge under construction. But because it is being built below the high water line, it will be under water part of the year (page 137). There were stretches of fabulous highway. But every few miles, we ran into long, barely passable sections of unfinished construction. 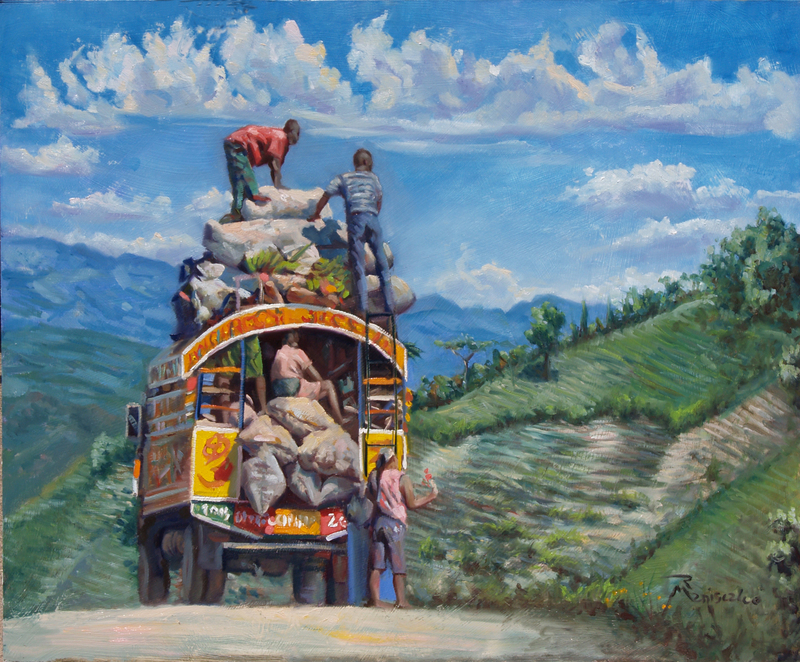 The materials used in road construction in Haiti are those rejected by the rest of the world so it won’t be long before these roads too, if ever finished, will crumble. Today, we passed the mass graves of thousands of Haitians killed in the 2010 earthquake. A cinder-block wall separates the graves from the general populace. The famous tent city stands on the side of the mountain, which has since given way to a shanty town, affectionately called Obama 2. Apparently, the Red Cross was very good at collecting relief money but not so good at building the homes it promised. And so, the people go on suffering and overcoming, each in their own way. I truly love the people of Haiti. They are sinners, like us, struggling valiantly to find the light. They live the Gospel loudly. Every day is precarious, and filled with life or death drama. Nothing is certain here. They are all of us, magnified by a thousand. 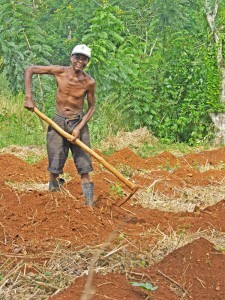 A Haitian farmer pauses from his work. The teenagers I encountered at Bread of Life were respectful, well-mannered, grateful, compassionate, generous and dignified. The men and women I encountered, who work at WM and in the fields, in the mountains, in villages and towns, reflected similar values. They have every reason to resent the plight into which they were born. But they learned early in life that they are in control of their thoughts, even as they learned to depend on a loving God. In short, they are nothing like the entitled, brooding, lost narcissists we often encounter in the U.S., who are ruled by their emotions and desires. Do people have to live through earthquakes, hurricanes, and the tragic loss of their parents in order to attain the gentle humility that the people of Haiti demonstrated? I have learned humility through much humiliation over the years, pursuing the dreams others had for me, trying to please authorities whose only interest was in pleasing themselves; I was miserable. Now my work is an offering to God. True humility is what makes us human; both words are derived from the same root, humus. Being grateful is our best access to humility. Even as my feelings change, my practice is always to be grateful. Quench, the Book, Coming Soon! Glenna Love liked this on Facebook.